SPOKANE, Wash. – When it comes to precipitation, the Inland Northwest has really been dumped on. Look no further than the pot holes, soggy lawns and tattered rubber boots for proof. And now — landslides. In the past month, roughly 100 weather-triggered slides have been identified in northeastern Washington, according to the Department of Natural Resources. 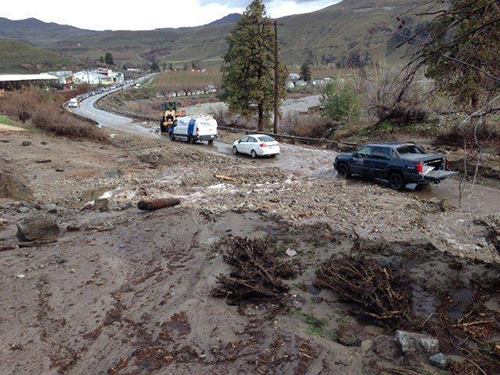 And earlier this week, the National Weather Service in Spokane issued an alert for increased threat of rock and mudslides across parts of eastern Washington and northern Idaho. “Rain . . . will aggravate these conditions and further heighten the risk,” the agency warned on its website. Mudslides are typically triggered by intense rainfalls on water-saturated soil. Washington state, with its intermittent heavy rains, many hills, steep slopes and mountains, is ripe for these downslope rivers of mud. More liquefied than landslides, they pick up trees, rocks and other debris and can accelerate as fast as 35 mph, according to the U.S. Geological Survey. Mudslides are common across the state but rarely deadly. One recent exception is the massive Oso slide that killed 43 people following weeks of drenching rain in March 2014. Landslides are large downward movements of earth — generally more rocks, gravel and dirt than mud. While heavy precipitation can play a role in triggering them, so can drought, erosion and earthquakes. 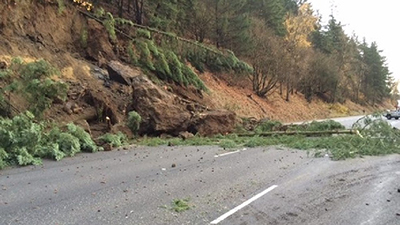 Like mudslides, they’re common in Washington and occasionally have deadly consequences. In 1995, two Spokane residents were killed when a rocky hillside collapsed along State Highway 97-A near Wenatchee. As you may recall, last month was the second wettest March on record in the Spokane area, with 4.11 inches of precipitation. Followed by a big snowmelt, dousing rain continues to saturate our region’s hillsides and slopes. The result? Just as the National Weather Service says an elevated risk of land and mudslides. And here in water-logged Washington state, especially mudslides.